Peacefully perched on the east coast of Fife, St Andrews is a hub of academic intelligence. St Andrews’ university, founded in 1410 and the oldest uni in Scotland, dominates the centre of the town, proving it to be the ultimate destination for prospective students. The town itself is unique and captivating; with a quaint charm that transcends the cobbled streets. 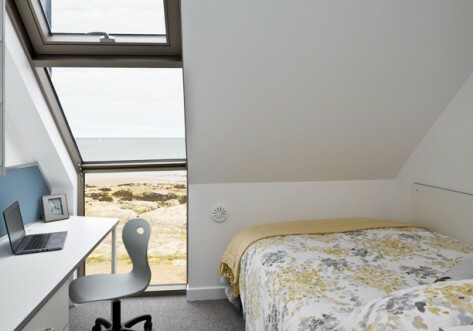 St Andrews is a quiet haven with a collegiate feel, well matched to its academic alliance and the perfect study space for students who favour a chilled out vibe. With the medieval layout of the town remaining intact, it’s certainly a place for exploring, with narrow alleys and old-world streets boasting delicate shops, cafes and restaurants. The university, central to the picturesque town, combines ivy-clad buildings with enchanting quadrangles and gardens, contributing to the surrounding romantic architecture. It’s no surprise that the university, one of the top in Britain and often aligned with Oxford and Cambridge, educated a number of famous graduates such as Prince William and Kate Middleton. As for out of study activities, St Andrews is known worldwide as the ‘home of golf’, owing to it’s seven golf courses (achieving the ‘largest golf complex in Europe’ title). If sport isn’t your style, perhaps you’d prefer a taste of the great outdoors. St Andrews proudly offers great beaches, including the magnificent West Sands, notably famous as the setting for the opening sequence of Chariots of Fire (the ultimate inspiration for study success?). With Dundee only a short bus ride away, ‘louder’ activities are within reach of the town, but for the ultimate relaxed environment, where education is at the forefront, this serene, picturesque and chilled-out town will comfort you throughout your studies. Make like royalty and head up North to St Andrews, for a step back in time that will further your future.